An effective way to overcome the Rothschilds-led synagogue of Satan (SOS), also known as the satanic Illuminati, is to change our system of government in western countries, such as the United States of America, Canada, the United Kingdom, Australia and New Zealand, from representative democracy, in which more than 400 million citizens are ruled over by just a few thousand elected ‘representatives’, to one of direct democracy, in which every citizen who wants to participate can vote voluntarily via the internet or via telephone on all of the issues that our elected ‘representatives’ currently decide on our behalf. Whichever of the two sides of any given issue receives more than 50% of the vote from citizens who voted, that will be the side on which policy and law is formulated and put into effect. The ONLY way to ensure the accuracy of the vote count on any given issue is to publish the manner in which every citizen voted, so that every citizen can check that their vote has been correctly recorded and so that anybody can check the accuracy of the vote count. Every citizen who votes on an issue should receive confirmation of the manner in which they voted by email. If they later check the published list of votes cast and find that their vote has not been accurately recorded, they can use this email confirmation as evidence of the actual manner in which they voted on the issue in order to have their vote corrected. The One Nation Party, which was founded in Australia in 1997 by Pauline Hanson, is controlled opposition. It pretends to represent opposition by Australian citizens to issues that are harming Australia like mass immigration, however its actual purpose is to discredit such opposition by deliberately making such opposition appear to be unappealing and unattractive to those who haven’t yet joined the ranks of such opposition. The One Nation Party was brought into existence by the Liberal Party of Australia in order to discredit anti-immigration sentiment among Australian citizens. Pauline Hanson discredited it in the latish 1990s by saying outlandish things and thereby brought anti-immigration sentiment into disrepute. She associated it with racism in the minds of the public instead of identifying mass immigration as the cause of congestion, higher unemployment and higher house prices by simply adding more people into the country, irrespective of their race, which is completely irrelevant. Hanson entered politics as a member of Ipswich City Council in 1994. Hanson was an Australian Member of Parliament from 1996 to 1998. In 1996 she joined the Liberal Party of Australia and was endorsed as the Liberal candidate for the House of Representatives electorate of Oxley (based in Ipswich) for the March 1996 Federal election. At the time, the seat was thought of as a Labor stronghold. Hayden's successor, Les Scott, held it with a 12.6% two-party majority, making it the safest Labor seat in Queensland. 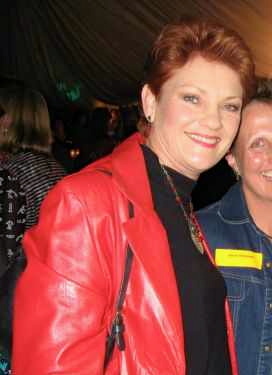 Leading up to the 1996 election, Hanson advocated the abolition of special government assistance for Aborigines, and she was disendorsed by the Liberal Party. Ballot papers had already been printed listing Hanson as the Liberal candidate, and the Australian Electoral Commission had closed nominations for the seat. As a result, Hanson was still listed as the Liberal candidate when votes were cast, even though Liberal leader John Howard had declared she would not be allowed to sit with the Liberals if elected. On election night, Hanson took a large lead on the first count and picked up enough Democrat preferences to defeat Scott on the sixth count. She won 54 percent of the two-candidate preferred vote. Had she still been running as a Liberal, the 19.3 percent swing would have been the largest two-party swing of the election. Due to her disendorsement, she entered parliament as an independent. David Oldfield worked in 1996 as a staffer for Tony Abbott, the representative in the Australian Federal Parliament for the electorate of Warringah, as indicated on the following section of David Oldfield’s Wikipedia page. (Tony Abbott became the Member of the Australian Federal Parliament for the electorate of Warringah in March, 1994 and has held this role for more than twenty-two years ever since.) While still working as a staffer for Tony Abbott, David Oldfield is purported to have ‘secretly’ established the One Nation party with Pauline Hanson and David Ettridge, as indicated on the following excerpt from David Oldfield’s Wikipedia page. Oldfield grew up in Manly, a beachside suburb of Sydney. He attended Balgowlah Boys School. Manly is part of the federal constituency of Warringah, which became occupied in 1994 by Oldfield's future employer, the then-Liberal minister and future Prime Minister, Tony Abbott. In 1996, Oldfield became employed as a staff member for Tony Abbott. Oldfield later become one of his adversaries. While in that position, Oldfield secretly co-founded the right-wing One Nation Party in concert with independent Queensland MP Pauline Hanson and campaign specialist David Ettridge. He and Ettridge were seen as the masterminds of the structure of One Nation behind Hanson's populist image and style. The fact that BOTH Pauline Hanson and David Oldfield were officially involved in the Liberal Party of Australia before and while forming the One Nation Party, respectively, tells me that the One Nation Party is controlled opposition which was designed and brought into existence by the Liberal Party of Australia. Tony Abbott likely played a key role in the design and establishment of the One Nation Party, since Tony Abbott was the employer of David Oldfield as a staffer in 1996 at the same time that David Oldfield is claimed to have been involved in forming the One Nation Party ‘secretly’. David Oldfield was likely being coached by Tony Abbott while David Oldfield was engaged in forming the One Nation Party ‘secretly’. Tony Abbott’s role in the destruction of the One Nation Party was also designed to conceal his involvement in the creation of the One Nation Party. 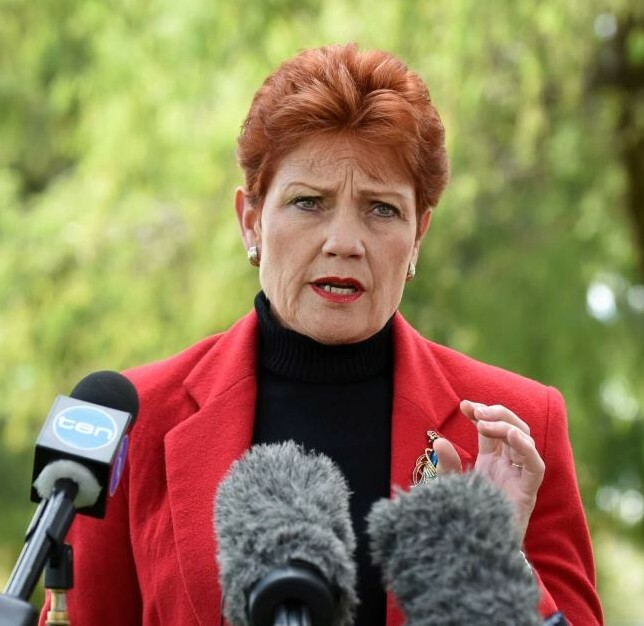 The whole saga of the One Nation Party has been orchestrated theatre from the start in order to capture the support of Australians who were opposed to mass immigration and then discredit that opposition to mass immigration by way of Pauline Hanson saying outlandish things. Following is an excerpt from Pauline Hanson’s Wikipedia web page outlining what her party, One Nation, stood for. It includes many of the things that those opposed to the Rothschilds-led synagogue of Satan are fighting for today, which are marked in bold. The purpose of Pauline Hanson and her synagogue of Satan-orchestrated One Nation party of controlled opposition is to discredit all of these positions in various ways such as by portraying herself as a racist. In its late 1990s incarnation, One Nation called for zero net immigration, an end to multiculturalism and a revival of Australia's Anglo-Celtic cultural tradition which it says has been diminished, the abolition of native title and the Aboriginal and Torres Strait Islander Commission (ATSIC), an end to special Aboriginal funding programs, opposition to Aboriginal reconciliation which the party says will create two nations, and a review of the 1967 constitutional referendum which gave the Commonwealth power to legislate for Aborigines. The party's economic position was to support protectionism and trade retaliation, increased restrictions on foreign capital and the flow of capital overseas, and a general reversal of globalisation's influence on the Australian economy. Domestically, One Nation opposed privatization, competition policy, and the GST, while proposing a government subsidised people's bank to provide 2 per cent loans to farmers, small business, and manufacturers. On foreign policy, One Nation called for a review of Australia's United Nations membership, a repudiation of Australia's UN treaties, an end to foreign aid and to ban foreigners from owning Australian land. Pauline Hanson is a member of the Order of the Eastern Star whose allegiance is to the Rothschilds-led synagogue of Satan, which is why she wears the occult colours of red and black. The Order of the Eastern Star is a satanic organisation for females which is the counterpart of Freemasonry, a satanic organisation for males. The purpose of both Freemasonry and the Order of the Eastern Star is to serve the agenda of the synagogue of Satan and carry out its plans. Tony Abbott, for whom David Oldfield worked as a staffer in 1996, and who later played a key role in the orchestrated theatrics of the political persecution of Pauline Hanson (which was designed to diminish her credibility and the credibility of the One Nation Party), is a Freemason. I strongly suspect that David Oldfield is also a Freemason. I strongly suspect that David Ettridge, who was closely involved with the One Nation Party, is also a Freemason. The reason that the following logo for the Liberal Party of Australia gratuitously has three shapes of essentially equal size with the Australian flag only occupying one of them, is that one third of the angels in heaven were led by Satan in rebellion against God. The Liberal Party of Australia represents the Rothschilds-led synagogue of Satan, also known as the satanic Illuminati, and its satanic agenda of globalisation and world government. The Liberal Party is absolutely controlled with an iron-fisted control by the synagogue of Satan and by Freemasonry that serves the synagogue of Satan. Pauline Hanson’s One Nation party was set up by the Liberal Party. The purpose of the establishment of the One Nation Party was to discredit opposition to the plan that the Liberal Party had for Australia when it came into federal power over Australia in March, 1996 with John Howard as the Australian Prime Minister. Criminalisation of the right to own and operate a firearm, using the staged Port Arthur massacre in late April, 1996 to build public support for this criminalisation. Increased immigration, which the Liberal Party of Australia has accomplished by focusing on a few thousand ‘boat people’ each year ad nauseum, while multiple scores of thousands of immigrants pour into Australia each year through formal immigration channels, so that Australia now admits in the order of 200,000 immigrants each year, resulting in increased congestion, higher unemployment due to increased demand for jobs and higher house prices due to increased demand for housing. Use of mass immigration from Asian countries into Australia to facilitate the establishment of an Asia-Pacific Union including Australia, modelled upon the European Union, which requires the dissolution of the sovereignty of Australia. Introduction of the toxic Goods & Services Tax (GST) on 1st July, 2000, which greatly complicates the business affairs of Australian businesses and which is another highly significant drain on the wealth of Australian citizens. Increased privatisation of public assets so that the SOS-controlled Liberal Party is now so manic that it wants to privatise every public asset in sight. Ownership of Australian residential property by foreign citizens who are not Australian citizens, which is one of the most offensive slaps in the face that the Liberal Party of Australia has ever given Australian citizens, and which has contributed to the increased demand for Australian residential housing and the current stratospheric prices of Australian residential housing - the fourth most basic need after water, food and clothing. The current Australian Federal Parliament House in Canberra, Australia was built at a cost of $1.1 billion AUD in 9th May, 1988 dollars when it was opened. Australians, including myself, largely couldn’t figure out why such an expensive building had been constructed for the Australian Federal Parliament. Their confusion is completely understandable. The vast amount of money that was spent on this building indicates that the above synagogue of Satan plan for Australia was conceived by 9th May, 1988 when this building was opened. Paul Keating, a Freemason whose allegiance is to the synagogue of Satan, presided over a contrived recession in Australia from 1989 to 1991, which had a devastating impact on Australian citizens, with interest rates reaching more than 20% at various times. The synagogue of Satan deliberately manufactured this recession to mercilessly break Australian citizens down. In their weakened state, in the ensuing years and decades that followed, the above synagogue of Satan agenda was imposed upon them. It would appear that planning by the synagogue of Satan to diminish the quality of life of Australian citizens commenced in the late 1970s or even earlier when it realised the stunning prosperity and quality of life that Australian citizens enjoyed. Wherever in the world the synagogue of Satan finds people enjoying their lives and thriving in peace and prosperity, it seeks to introduce turmoil to diminish their quality of life. Its efforts to pull Australian citizens down from their enviable position intensified in 1983 with the election of Freemason Bob Hawke to the position of Prime Minister and the start of the wholesale deregulation of the Australian economy that followed his election.